🐦 Albatross is the largest seabird in the world. Among all kinds of birds, bird albatross has the longest wing sizes up to 4 m in length. 🐦 Albatross birds are often seen flying without wings flapping at all, he just seemed to open wide its wings close to the surf and just rely on the wind alone. 🐦 With great wings and long, Bird Albatross able to cross the ocean and migrate as far as 15,000 km. 🐦 Albatross birds can fly up to 800 km in just 12 hours of flying. 🐦 Albatross lived on earth the south that has cold air, he was able to survive there only by eating fish, squid, shrimp and drinking sea water. 🐦 Albatross bird spends most of its life amid the ocean, they just go back to land to lay eggs and raise their young. 🐦 Albatross bird eggs hatch on average within 80 days, much longer than other birds that the average is 30-40 days. 🐦 When the bird Albatross child has reached the age of 10 months, usually they will be left behind by its mother and the children will follow the parent birds leave the island where they were born to the marine off and will return to the place they were born after they mature to breed. 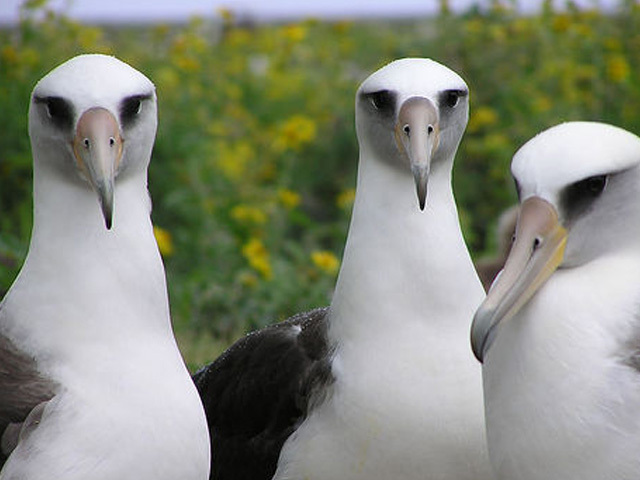 🐦 Throughout the world, there are 21 species of albatross and 19 of them declared endangered. That's are 9 fact about albatross that we can share, happy reading and don't forget to check another animals facts.